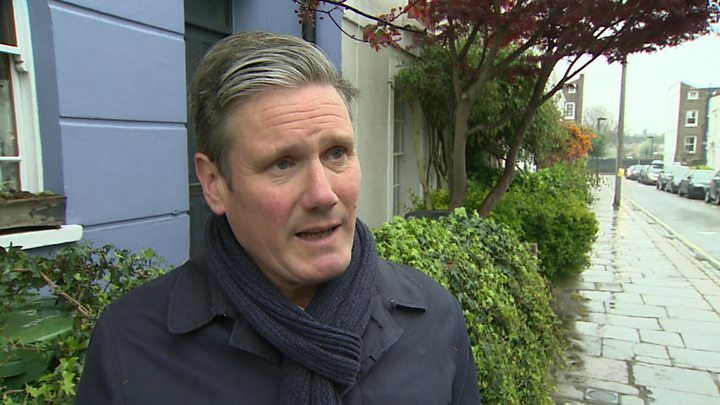 Media captionStarmer: "We haven't seen change of Brexit position"
"The ball is in the government's court" when it comes to a way forward with Brexit, Labour's Sir Keir Starmer says. Talks between Labour and the government began last week, with Theresa May saying only a cross-party pact would see MPs agree a deal in Parliament. But the shadow Brexit secretary said Mrs May's team had "not changed its position" on her existing plan. The PM will meet German Chancellor Angela Merkel and French President Emmanuel Macron on Tuesday. Mrs May's spokesman said she was also making calls to other European leaders from Downing Street on Monday afternoon. She is due at an emergency summit in Brussels on Wednesday, where EU leaders will expect to hear fresh plans ahead of the UK's scheduled exit date - Friday at 23:00 BST. Meanwhile, peers are continuing to examine a bill brought by senior Labour MP Yvette Cooper, which aims to force the PM to request a Brexit extension rather than leave the EU without a deal. Despite communications over the weekend, there were no further talks with Labour scheduled for Monday. However, Sir Keir - who is part of Labour's negotiating team - added: "I have no doubt things will develop today." BBC political editor Laura Kuenssberg said the party was now "expecting [an] updated proposal" from the government, and more formal talks could take place this afternoon. Foreign Secretary Jeremy Hunt said Mrs May was leaving "no stone unturned" to try and resolve Brexit, while Culture Secretary Jeremy Wright told BBC Radio 4's Today programme that all sides needed to be "prepared to compromise" to "fulfil the primary objective" of leaving the EU. But shadow transport secretary Andy McDonald told BBC's Radio 4's Today programme that talks between the parties had "not been entirely productive". Several Conservatives have also strongly criticised the move, with the former Foreign Secretary Boris Johnson using his column in Monday's Daily Telegraph to warn that Tory MPs would not allow Mrs May to "surrender" to Mr Corbyn. The EU's chief Brexit negotiator, Michel Barnier, is in Dublin for talks with the Irish Taoiseach Leo Varadkar. The pair are expected to discuss developments in London, as well as ongoing planning for a possible no-deal scenario. On Sunday, Mrs May tweeted a video message, explaining her decision to negotiate with Labour, saying: "People didn't vote on party lines when it came to the Brexit referendum. "And I think members of the public want to see their politicians working together more often." If no compromise can be reached with Labour, Mrs May has committed to putting a series of Brexit options to the Commons and being bound by the result. Sir Keir said the talks had been taking place "in good faith" and that "both sides... have approached this in the spirit of trying to find a way forward". But he added: "At the moment we are waiting to see what the government is putting on the table as a proposal. "All they have done so far is indicate various things but not to change the political declaration [the non-legally binding document setting out the UK's future relationship with the EU] so the ball is in the government's court. "We need to see what they come back with and when we do we will take a collective position on that." 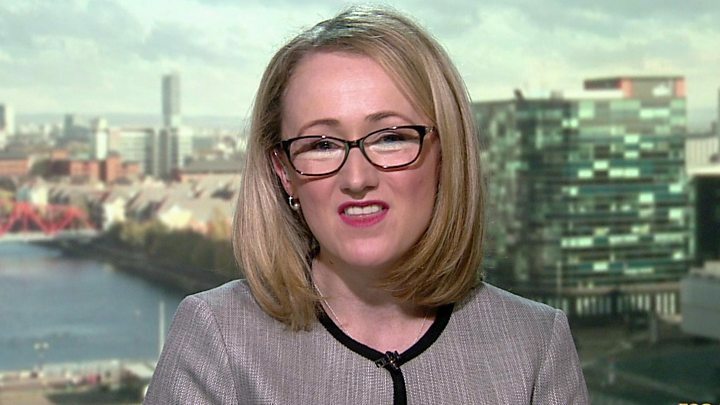 Rebecca Long-Bailey, who is also a member of Labour's negotiating team, described the mood as "positive and hopeful" - but she told the BBC's Andrew Marr show the government's proposals "have not been compliant with the definition of a customs union", which is her party's key demand. However, Solicitor General Robert Buckland told BBC Radio 4's Westminster Hour that "something approximating a customs arrangement or customs union" was the most likely outcome of the talks. "In this particular hung Parliament none of us can get perfection, we need to compromise," he added. Ms Long-Bailey also suggested Labour could be prepared to cancel Brexit by revoking Article 50 - the legal mechanism through which Brexit is taking place - if the UK was heading towards a no-deal scenario on Friday. Although 12 April remains, in law, the date the UK will leave the EU, Mrs May has already requested that be rescheduled until the end of June. 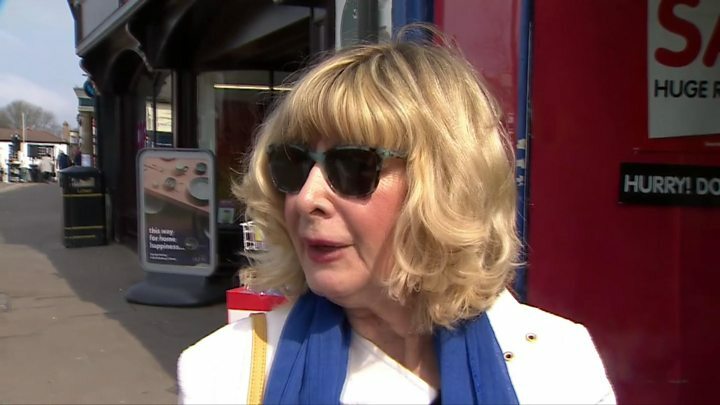 BBC political correspondent Vicki Young said if EU leaders did not think she had a credible plan to get Parliament behind a deal, they might refuse or insist on a much lengthier extension to the Brexit process. This outcome is opposed by some Tory Brexiteers as it would mean the UK having to take part in European Parliamentary elections.